If you have been planning a trip to Vietnam, you may be questioning whether or not you need to make a stop at Halong Bay. It's one of the most beautiful areas in Vietnam, and it is popular with many visitors. Here are a few reasons why you should visit the region and spend some time in this amazing location. The scenery in and around Halong is breathtaking. The water stretches for miles and is dotted with thousands of small islands. Many of these islands are large, mountainous rocks that jut up from the bay. Other islands are large enough for people to explore. The unique arrangement of water, mountains and wildlife prompted UNESCO to name Halong Bay as a World Heritage Site. While many places can be explored thoroughly, there are some areas where visitors are restricted in order to preserve the natural habitat. There are many activities that tourists can enjoy at Halong Bay. They can tour Cat Ba National Park, where they will see an abundance of wildlife. Tourists can also enjoy hiking excursions on several of the mountains of various islands. Kayaking, canoeing, climbing and biking are also among the activities that visitors regularly enjoy. The can even sunbathe or swim on the many beaches in the area. One of the most unique things about Halong is its numerous caves. There are caves scattered about the region, and many of them can be viewed by tourists. Since Halong Bay was formed over millions of years by the rise and fall of the water, there are unusual formations to be found in every cave. Some of the caves have been prepared for tourists with easy walkways and special lights. Other caves have been left in their natural state, which makes viewing them even more fascinating. Most travelers tour Halong Bay by way of a cruise. There are many cruises available, which makes it easy for tourists to find a price and package that suits their needs. 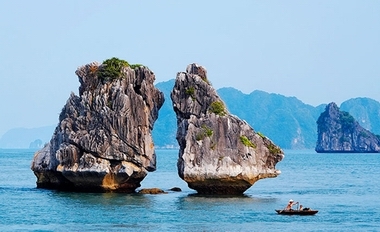 Some cruises are short and allow passengers to see the most popular sites in Halong Bay. Other tours allow visitors to spend the night on the boat while they view and explore the islands during the day. Taking a cruise is the preferred method for most tourists because they are able to do so much by way of a boat. Halong Bay has long been considered as one of the most beautiful areas of the world, but it has recently been seen as even more spectacular. It has been placed on the list of New 7 Wonders of Nature due to its unusual caves, islands and wildlife. This makes it a must-see destination for travelers when they go to Vietnam.